I love that you made a little Hoss stamp! That is sooo adorable! And he looks so confident wearing his self imaged bandana...haha. So where do you get the soft white rubber? Do you know? 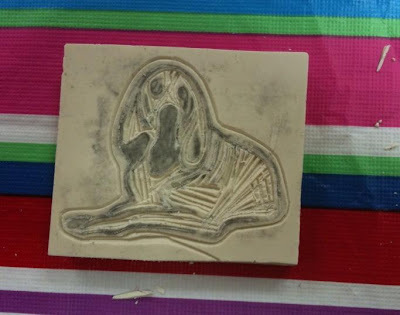 I'd love to try making a stamp. That is very cool. I love your dog. He looks like a good, faithful pup. Happy Friday to you! So i went to trusty Ebay and found a rubber stamp exactly like i wanted, and i am getting gold ink, so i'll just stamp the envelope instead. i'm also using the same image on the reply cards i'm printing up. btw, the total cost for wedding-related stampage? Eight bucks. Hey looks so proud in the first picture. "Yes, my owner made me this. Thank you, I know she's quite talented." "oh yeah, i'm the coolest dog on the block"
awwww he does look very proud of his bandana!